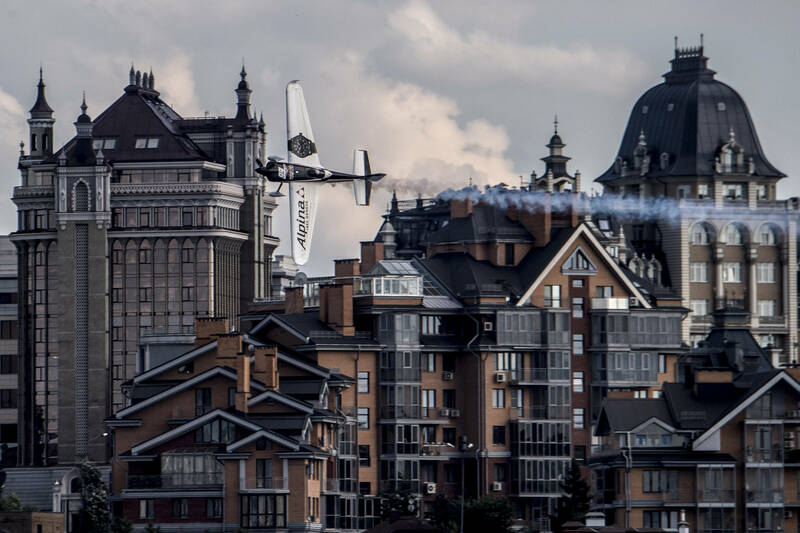 Michael Goulian and Team 99 have returned to the podium at the Red Bull Air Race in Kazan, Russia with a brilliant third place finish. For Team 99, this podium finish is the realization of a goal they have been working towards in earnest over two seasons of racing. It serves as validation of the hours of effort improving their Edge 540 race plane, honing their strategy, and refining the dynamics within the team. Leaving Russia, trophy in hand, allow Goulian and his team to set their aim higher, with a clear sight to a race win. The podium finish is especially rewarding given the challenging conditions of the race course. Tattered remnants of pylons filled the air in Russia like confetti at a parade Sunday morning. A subtle wind pushed the race pilots further into the harshest corners of the race course. 7 out of 14 pilots toppled a pylon in the first round of competition, knocking several favorites out of the running and turning the competition into a free-for-all. Goulian, flying in the first heat of the Round of 14, had to fly without the advantage of watching the misfortune of his competitors. He would be the first to slice a pylon, though his time of 1:00.531 was still fast enough to allow passage into the Round of 8 as the “fastest loser.” The two pilots sitting atop the World Championship leader board; Japan’s Yoshi Muroya, and the Czech Martin Sonka were unable to best Goulian’s time, ending their respective bids for victory. Moving into the Round of 8, Goulian was matched against Christian Bolton of Chile. Bolton amassed an unfortunate string of penalties in his flight, presenting an open window for Goulian and Team 99. The course bit again, with Goulian striking pylon #4, though he held on to an impressive 3 second lead over Bolton. Goulian moved into the final round of competition for the first time of the 2017 season.